The record includes songs about the Colonel wearing the same thing every day and facts about Nashville you can find via the internet. KFC has released what it calls the "spiciest and smokiest" album of the year to celebrate its Nashville Hot Chicken. All songs on the album, which is available on vinyl and online, are written, produced, and performed by comedian Fred Armisen. 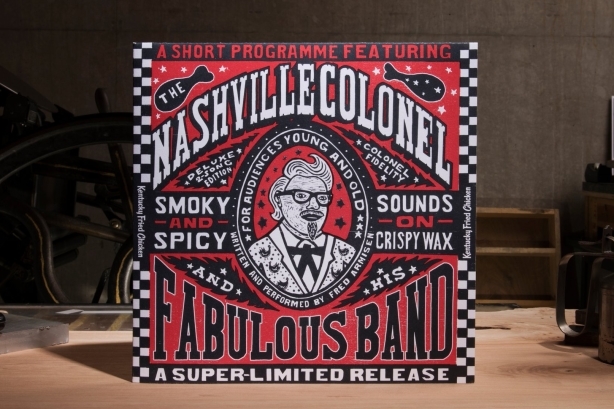 The album, called "A Short Programme featuring the Nashville Colonel and his Fabulous Band," includes just two songs. The first ditty, titled "C-O-L-O-N-E-L," is about how the Colonel wears the same thing every day; while the second tune, "Nashville-Centric Boogie," includes "some facts about Nashville you can find via simple internet search," as Armisen proclaims in the opening lyric. KFC seems a little confused about vinyl etymology on the website, calling the product variously an album and an EP, when it fact it is really a single, as it only contains two tracks. Albums typically contain around eight tracks and play at 33 1/3 RPM, while singles spin at 45 RPM. EPs usually have around four tracks. The record pays homage to the Colonel's "tradition of producing his own vinyl albums, all complete with Colonel Sanders gracing the album cover to promote his crave-able chicken," according to a release. It adds that KFC produced a variety of albums in the 1960s. Only 125 copies of the record were produced, and they have been hidden in 14 record stores across the country. A list of locations is available on KFC’s website. A microsite, www.nashvillehotrecord.com, was also created so any fan has access to the album. KFC’s Nashville Hot Chicken was only meant to be available for a limited time, but the chain has extended the menu item’s run through April 2017 due to high demand. KFC started selling Nashville Hot Chicken in January. KFC posted about the album on its social media channels on Monday.